Former Name: Leiphaimos parasitica Schltdl. & Cham. Habit: Voyria parasitica grows as a mostly unbranched, herbaceous, glabrous, saprophyte up to 35 cm in height, usually much smaller. The bipinnately compound leaves are alternately arranged. The leaves reduced to small scales. The stems and scales are unpigmented and non-photosynthetic. The actinomorphic, complete, perfect flowers are arranged in terminal racemes. 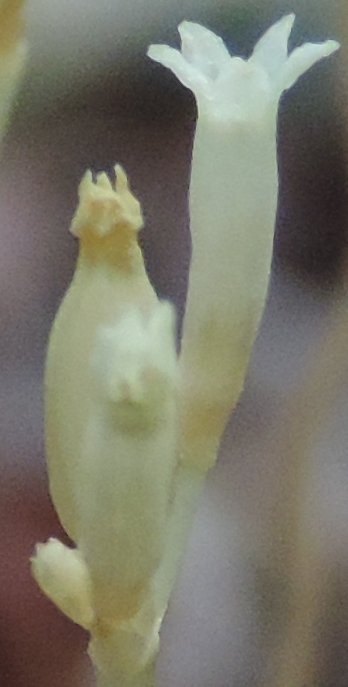 The calyx has 5 white, fused, sepals. The corolla has 5 white, fused petals. There are 5 stamens fused to the corolla. The ovary is superior, forming a many seeded capsule. Habitat: Voyria parasitica grows in organic humus layers in Dry Broadleaf Evergreen Formation – Forest/Shrubland (coppice). Distribution in Bahamas/Globally: Voyria parasitica occurs on central and northern Bahamian Archipelago as well as south Florida, Mexico, and Central America. Medicinal/Cultural/Economic usage: Voyria parasitica is not known to be used medicinally in The Bahamas.